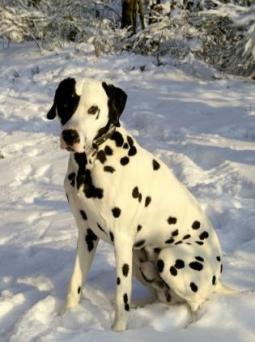 The distinctive spotted coat of the Dalmatian sets it apart from any other breed. The classic look of these sporting dogs has remained virtually unchanged over the centuries. Dalmatians are one of the oldest dog breeds known to man, although their exact origins are somewhat shrouded. The earliest recorded history of the breed places them in regions of Asia and Europe, particularly in Dalmatia, and it's from here that the breed takes its name. Historically, Dals have been known as coaching dogs, running around and beneath carriages, following their master's travels. They are also known as the fireman's friend, and once traveled along on runs in the days of the horse-pulled fire wagon. Today, the Dalmatian is perhaps most easily recognized as one of Disney's perennial stars. Unfortunately, the amount of attention this has brought to the breed hasn't exactly been a blessing. Each time a new movie is released; Dalmatian mania begins anew and people eager to cash in on the craze produce a flood of litters without much thought about confirmation and temperament. Some buyers, infatuated with the trained dogs they see on the screen, rush to purchase pups. Many quickly become disillusioned with their new pets when they realize how much time and energy it takes to raise them. Far too often these hastily purchased pets wind up in shelters seeking new homes. Sadly, indiscriminate breeding and impulse buying have both taken a heavy toll on the breed, giving them an unfair reputation as hyperactive and unreliable. 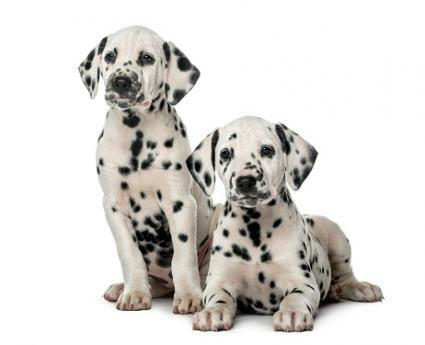 In reality, Dalmatians are neither of these things when they are properly bred and handled. Dalmatians are sturdy, balanced dogs that should carry themselves with poise and dignity. Individuals range from nineteen to twenty-four inches high, and weigh approximately fifty to seventy pounds. This is a very intelligent and energetic breed that requires a good deal of daily exercise to remain physically fit and well adjusted. The Dal's spots are its glory, but it's interesting to know that these dogs are completely white at birth. Spots begin to show a short time later. Spotting may be either black or liver, but any other colors are considered a fault. Patterning is also very important because it gives these dogs their distinct appearance. Spots range from dime-size to fifty-cent pieces, and should be well defined and distributed evenly over the white background. Patches are considered a disqualification in the breed ring according to the American Kennel Club. Temperaments range widely, depending on whether an individual is the product of a responsible breeding program or a puppy mill. Dals are naturally high energy dogs, requiring lots of positive early supervision to channel that energy into good behaviors and away from destructive ones. Generally speaking, males tend to be a bit easier going than females, who are more territorial. Both sexes are rather reserved around newcomers. This natural tendency makes Dals fairly good watchdogs. Dals have the potential to make great family members. However, it's important to supervise pets and young family members in the correct way to play together. Dalmatians generally do not react well to surprises, and even the most well-meaning child is apt to receive a nip if he or she gets too rambunctious or sneaks up behind the dog unannounced. Deafness in Dals is well documented, with around twelve percent of the breed affected. Whether or not affected dogs make suitable pets is a point of contention among breeders. Some believe deaf dogs can still make good pets in adult homes, but perhaps not around children. Deaf dogs tend to overcompensate for their disability by becoming more protective and sometimes this is expressed as aggression. A sleeping dog, startled awake, may have a tendency to lash out instinctively, causing injury to whoever is near. For this reason, some breeders believe that all deaf Dalatians should be euthanized. Dalmatians have many fine qualities, including devotion to their owners, but they are definitely not the breed for everyone. If you find yourself undeniably attracted to those spots, better take a step back and do your homework first. Visit several breeders and spend time with both puppies and adults. Then you'll have a much better idea of what it takes raise a healthy, energetic pup into a well behaved member of your household.